Dan, have you noted the response of “Rick Anderson”? He seems to make a good point or two, and they shouldn’t be just casually dismissed. I’m a child of immigrants, but this is too serious an issue for anyone to fall for (or resort to) the “sentimental” [if not cliched] arguments. 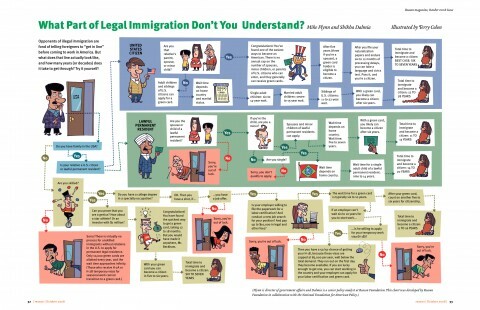 Why should US citizens feel obligated to support illegal aliens? When so many Americans are losing jobs and can not support their families, why should the US be allowing competition from foreign nationals? Does Rick also favor suspending car imports from Japan, electronic imports from China, sugar imports from the Caribbean, and so on, as well? Why are foreign nationals with H1-B visas working at US government agencies while many US citizens with those skills are not being employed? Because the rest of us would prefer a competent government workforce to a government workforce that operates as part of the welfare system. The governments of these workers do not allow large numbers of US workers to compete for jobs in their countries, why should the US? Is Rick upset that his dreams of working as a campesino are being cruelly denied him, or is he wondering why the US citizenry enjoys a better selection of labor than the citizens of other countries? P.S., glad you liked it! Reason also played a role in the Marguerite Watkins scandal at IUPUI .